I’ve been slowly migrating from a Windows Laptop to a MacBook Pro. And Office 15 for Mac is great, I had my work Exchange Email up in no time, then I configured my POP email accounts. The problem is Outlook puts all POP mail in one folder called ‘on my computer’. I have a quite a few POP email accounts, and I like to keep them all separate. I will assume you already have your POP email account(s) setup, I suggest to avoid confusion you carry out this process one account at a time to avoid confusion. 1. 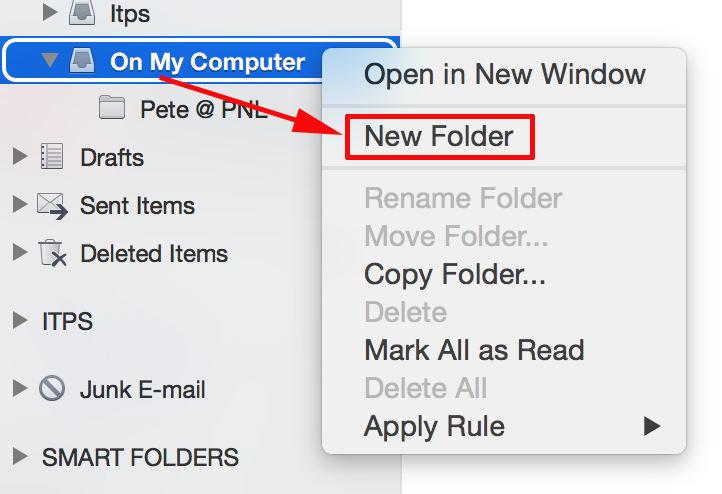 In the ‘On My Computer’ folder create a new folder for your new account. 2. Create a new ‘Rule’ that applies to your POP account, and set it to ‘Move Message’ to the folder you created. You can repeat for each new POP mail account.